As announced earlier today, the Canada Foundation for Innovation and Quebec government will contribute over $100M in research infrastructure support to McGill. The Government of Canada announced today a national investment of $333 million for research infrastructure through the Canada Foundation for Innovation (CFI). 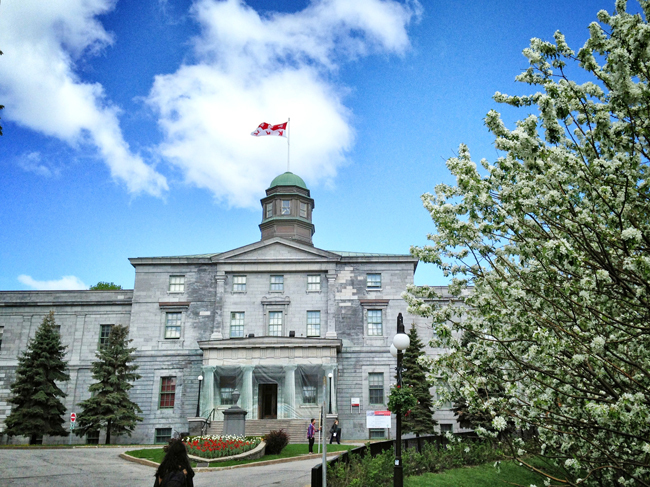 Ten projects submitted by McGill and its hospital-affiliated research institutes have received a total of $30 million in funding, which will be matched by the Government of Quebec. Partner-led proposals, which will see McGill researchers participating in pan-Canadian large-scale platforms including Genomics Enterprise (CGEn) and TRIUMF, boost McGill’s total funding allocation to $45 million. With the provincial contribution this investment leverages a total renewal of research infrastructure across the McGill campus of more than $100 million. “On behalf of McGill University, I thank the Government of Canada, Canada Foundation for Innovation, and the Government of Québec, for their continued support for research and innovation. This important investment in state-of-the-art research infrastructure enables Canadian researchers and their partners to continue to be among the world’s leaders in areas of great importance both to Canada and globally,” said Principal and Vice Chancellor, Prof. Suzanne Fortier. The Government of Canada investments through the CFI equip universities, colleges and research hospitals across the country with state-of-the-art tools and laboratories where researchers can discover and innovate. Their ideas and inventions help create jobs, improve the health and quality of life of Canadians and further Canada’s reputation for research excellence. The McGill- and MUHC-led projects include a first-of-its-kind research facility focused on measuring the effects of mild Trauma Brain Injury (mTBI), such as concussions, and developing real treatments for mTBI. This new facility, led by researchers with expertise in neurology, psychology, ophthalmology, physics and engineering, and enabled by the almost $3 million in funds for the requested infrastructure, will become a leading-edge research centre. “With the support of the CFI, our team will have an Ultra High Performance MRI system that will be able to carry out more applications than any existing MRI system and will help us observe the brain’s response to trauma with exceptional precision. This knowledge will allow us to develop new diagnostic tools and treatments to help thousands of Canadians who suffer head injuries every year, said Alain Ptito, CFI-funded researcher and Director of the Department of Psychology at the McGill University Health Centre (MUHC), and a medical scientist at the Research Institute of the MUHC. Researchers from the Centre for Interdisciplinary Research in Music Media and Technology (CIRMMT), housed at the Schulich School of Music, received over $4 million in funding from the CFI, which will be used to create a unique interconnected research hub linking two exceptional spaces: McGill’s Multimedia Room (a large sound-isolated performance lab) and Université de Montréal’s Salle Claude Champagne (a superb concert hall). This hub will become the world’s leading research facility for the scientific study of live performance, movement of recorded sound in space, and remote, synchronous performance. “With this support from the CFI and from the Government of Québec, researchers at CIRMMT will have a unique integrated facility allowing us to study sound production by large ensembles, the ways in which performers coordinate with each other and reach the audience, as well as develop new technologies for live music performance and sound recording,” said CFI-funded researcher, William Dawson Scholar and Associate Professor of Music Technology Marcelo Wanderley.